Squeaky Clean Reviews:Why Shoot a Butler? Intermingled murder mystery and romance, though with an unlikable main character. Famously rude barrister Frank Amberley is only trying to reach his aunt and uncle's home via a shortcut when he stumbles across a car with a dead butler at the wheel. At the scene of the crime is Shirley Brown, who protests her innocence but obviously knows more about the business than she's willing to admit. Amberley is inclined to believe her, but as he takes upon himself the role of amateur detective and begins to investigate the butler's demise, Shirley's case begins to look less and less rosy. What connection does she have to the neighboring Fountain family and their now-dead butler? What mysteries are hiding in the Fountains' manor house? And who in the world would want to shoot a butler? Typical of most murder mysteries, there is a basic understanding that killing people is not to be condoned. There are also other crimes, intrigues, and vices, including blackmail and greed, that are shown in an unfavorable light. Otherwise, the morals are rather weak. Amberley is caustic and almost always rude, even to his aunt and uncle, and verbally abuses less brilliant characters; he also bends the truth in order to protect Shirley. As this is a murder mystery, there is some violence: two characters are shot, another drowned, and there is a case of kidnapping and attempted murder. Some scenes are rather more intense than others, and there are mentions of blood and passing descriptions of the bodies, but nothing is enough to make a reader squeamish. 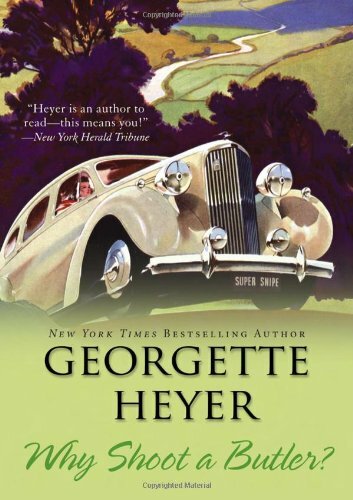 As one critical review points out, Heyer's works are "genteel mysteries," not the dark psychological books of Agatha Christie or even Conan Doyle. One character is a drunk, but this is shown in anything but an approving light. Brandy is used medicinally. "D***" is used fairly regularly, as is "hell"; God's name is taken in vain, also with some frequency. Georgette Heyer was a prolific writer, but despite the dozen or so mysteries she published, she is still best known for her dashing Regency romances. And indeed, reading "Why Shoot a Butler? ", I felt that in many ways it was a thinly disguised romance itself. The mystery is almost a side-note to the main point - Amberley and Shirley Brown. Keen mystery fans who have put a few dozen Agatha Christies under their belts may well be able to guess the conclusion of this book. But if Heyer is known for her romances, she is also known for writing original characters and snappy dialogue. This holds true of "Why Shoot a Butler?" - on the other hand, that doesn't always make the characters likable. Amberley himself can be intensely irritating in his lack of respect for anyone and his complete absorption in his own skill, especially as this is not tempered by a great deal of humor on his part. While the book follows several different characters in turn, including Shirley, they are not always very well developed. However, the dialogue is snappy: some of the most enjoyable parts are Amberley's talks with the rather-dense Sergeant Gubbins, and the casual insightfulness of Amberley's aunt. In terms of mystery, Heyer is probably not the best. But if a reader is looking for lighter fare than Agatha Christie, wry humor, and the flavor of mid-20th Century English gentility, he could do worse than to pick up this little novel.